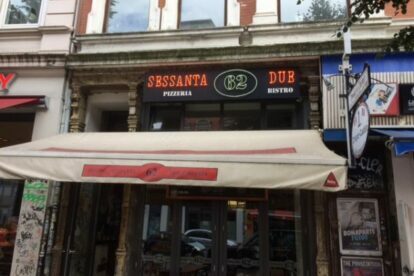 Sessanta Due is a restaurant in the heart of Sternschanze. In my opinion, it’s there that you will get the best Italian food – outside of Italy, that is. The cozy restaurant offers many tables inside and has a few beer benches outside. If the weather permits: have your pizza or pasta on the busy street of Schulterblatt and watch the people walk by as you eat your delicious food. Sometimes, I pay a visit to Sessanta Due in the evening hours before I explore the wild nightlife of Hamburg. The owner of the restaurant is happy to have a little chat with his guests and loves to tell stories about his restaurant, the city and other great places in Hamburg. I always feel at home at Sessanta Due.